Star Wars: Edge of the Empire, is the current incarnation of the Star Wars role-playing game. Published by Fantasy Flight Games this game comes as a 448 page full colour hardback. 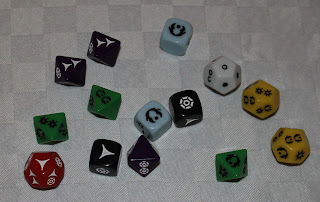 Available separately are sets of dice for use with the game. Yes this is a game that has its own custom dice, but bear with me here as I think they're worth it. So Star Wars: Edge of Empire is definitely a Star Wars RPG, set firmly in the setting we all know and love in the period after the events of the Battle of Yavin and the destruction of the first Death Star. Now there have been some criticisms of the setting (and connected rules) provided in this game as now being very Star Wars circulating on the net, and there is a lot of negativity about the game as a result of people expecting something that this game was never supposed to deliver, so lets get the elephant in the room out of the way immediately. Jedi, lightsabres, fighting valiantly against the Empire as part of the Rebellion starring down Star Destroyers and fighting squadrons of TIE fighters. All Star Wars tropes. All not part of this game. You see Fantasy Flight Games have decided they can't cover all the bases in one go, and there are many different aspects to the setting, so have decided to cover the main aspects one at a time. As a result Edge of Empire does not cover the Rebellion or Jedi, they will come in later releases one specifically for each of those topics. Some people reading this right now are going, "yay I hate Jedi anywhere there's so much more than can be explored," while some are thinking "no Jedi? Then it's not Star Wars." I personally make no pretense about it and find Jedi the least interesting part of the Star Wars setting. However I am a huge Star Wars fanboi and have been ever since I was a kid, and as a result this game speaks to me. So what is here if there's no Jedi or Rebellion? Well Edge of Empire is designed to cover the edge of the Empire. It's the outer reaches of space and civilization, the smuggler, the bounty hunter, the moisture farmer who wants to get off his dustball and see the galaxy. Basically role-playing with all the people on the fringes, all the stuff people were doing before getting involved with Jedi and rebellions. Han and Chewie making spice runs for Jabba, Lando conning people, all the people on the edge of the law or who are running from something. That is what this game is about. So now that out of the way, onto the book itself. The book is a well bound, full colour hardback, weighing in at 450 pages. There is plenty of artwork, but not so much as to take away from the setting and game material, and that artwork is all of a very high quality. Some of the art is original to the game, some is from other Fantasy Flight materials and some comes from the Lucas Arts archives where they seem to have been given access. Special mention has to be made of the font chosen for the book. The font for the majority of the text is about the same height as a normal font, however it is very light and narrow of stroke. This means that it can sometimes be hard to read. Now I have pretty much perfect eyesight, never had any issues and as a pilot I get a good eye test quite regularly, but if I wasn't reading in bright full on light I had trouble with the text. There simply isn't enough weight to it to be perfectly legible in a decent range of light and sight situations. I've heard from people who simply can't read it, it gives them too much eyestrain as the font isn't heavy enough. Since the line won't be released in PDF format there is the theory going around that the font was chosen to make it difficult to scan the books. Whether there is any truth in that, I don't know. I suggest however you look at a copy to ensure you can comfortably read it before purchasing. The only other issue I have with the layout is that sometimes, particularly as you come to the end of sections and columns, you can accidentally skip to the wrong section and have the reading not make sense. What I mean by this is that some sections flow through the regular columns as we're used to reading. You read down one column of text then read the next. Sometimes however if you come to the end of some sections, for layout purposes they will instead of continuing a section down a column they've wrap it across two columns at the top of the page and start the next section part way down the page and wrap it across both columns with not a huge amount of space between the sections. Many times while I was reading it I continued down the page into the next section without realising I should have skipped columns then come back. It can be confusing as it doesn't seem to stick to a style. The dice. A lot has been said about the special dice used for the game. Some like the idea, some don't. Personally, I love them. Confused? Actually it's pretty simple. You build your dice pool based on your characters skills and abilities, add bonus boost die dependant on the situation and that's the positive portion of your dice pool. The GM will then add your difficulty dice and any setback and challenge dice as appropriate to what is happening and then you roll them all. A failure cancels a success. A threat cancels an advantage. If the success number is positive the action is successful, if 0 or negative it is now. If the advantages are positive then you can get some other positive outcome to the roll often as a narrative result (you manage to duck back into cover after firing, you find something you weren't looking for.) If the threats are negative then you will suffer some kind of setback (you may have succeeded but now the path is blocked, you shot the stormtrooper but your blaster has just run out of ammo.) Triumph and Despair can add very powerful advantages and disadvantages to the outcome. I will agree the actual symbols used on the dice could be more intuitive, they're not immediately obvious what they may be, but once you have a few rolls people get it incredibly quickly so the learning curve is very low. If you really don't want to seek out the special dice (you'll need at least 2 packs, or 1 if you have the beginner game,) there is a conversion chart in the book for regular polyhedral dice to the Edge of Empire results, though consulting this could get cumbersome very quickly as opposed to the actual dice where it's very easy to determine the dice pool results from looking at them. I really recommend using the specific dice. So how about the game itself? Well unlike many of the reviews I do I've actually run Edge of the Empire, and I can tell you it's a blast. The dice system once you get used to it drives the game considerably. I find myself needing less prep for a session beyond the generalities because the interpretation of the dice when the players attempt something can narratively drive so much of the session. For character generation the players get to choose one of six careers; Smuggler, Colonist, Explorer, Technician, Hired Gun and Bounty Hunter. Each of these careers is then split into three specializations that give you the ability tree you are working on. During character creation you choose your career and initial specialization and off you go. A character is considered of the career they initially join, however they can spend their experience to buy into additional specializations, even those from other careers. For instance Han Solo would have taken the Smuggler career with the Scoundrel talent tree to begin with. However as we know our old friend Han has many other skills under his belt, so it stands to reason he's taken the Pilot specialization at some point (also from the Smuggler career) and later in life has ended up in the Politico tree under the Colonist career. Maybe a bit of mechanic under the Technician career. No matter all these other specializations, Han is still at heart a smuggler. One very key part of the character generation process is the subject of obligations. All characters start off with an obligation, with the option of buying more to gain additional experience or starting cash. An obligation is basically debts and, well, obligations that the character owes. It could be they have a bounty on their head or owe someone a lot of money, perhaps their family ties bind and restrict them more than they'd like or they're obsessed with finding the Katana Fleet or some such. These obligations can, under the stock system, come up in play either a plot points or just as dramatic tension. Characters have two trackable resources. The good old hit points and strain. The Hits threshold dictates how much damage physical damage a character can sustain and doesn't require much further explanation. Strain Threshold on the other hand is more interesting. Strain represents the characters duress, both physical and mental. It represents how much damage you can take from stun weapons for example, or how much psychological stress you can take. It's also interestingly an expendable resource for the players. A character can choose to experience strain to activate various special abilities and talents that their character may have, to gain extra manoeuvres during a combat and the like. If the character is suffering from an Obligation they may have their strain threshold reduced which obviously makes the available pool smaller. Spend too much, and you'll collapse. Don't use it and you'll be losing out on some of your better abilities and that little but of edge that makes a difference. Just don't get hit by a stun bolt while you're spending them. Strain can mechanically be recovered by gaining advantages on dice rolls or by rest. One of the most interesting and fun mechanics of the game is the Destiny Pool. The destiny pool is a set of Light Side and Dark Side counters that sit on the table and can be spent by both players and GM. If the players need a little extra boost for a roll they can flip one or more light side counters to the dark side to get that number of upgrades to their dice roll. Similarly the GM can spend Dark Side counters by flipping them to light side to help his NPCs rolls should he desire. The more interesting aspect is that after the controlling side decides if they're going to upgrade their roll the opposing side can choose to spend to upgrade the difficulty of the roll just the same way they could spend the points to upgrade their own. For example if the players really want to make that roll to shoot the Imperial Commander before he gets and summons reinforcements they could spend their light side points to upgrade their dice pool to make it more likely to succeed. After this if the GM is feeling mean he can then spend dark side points to make the shot more difficult. The Destiny Pool is determined randomly at the beginning of each session by each player rolling a force die and allocating the results to the pool. The pool is a very fun mechanic. Do you save your points for the really difficult challenges, knowing that if you're not spending your points they're not being given to the other side? This can result in a constant flow back and forth in the pool from light to dark and back again. Players are encouraged to spend to make things more heroic while GMs are encouraged to use it to make it more dramatic, swing things in their characters favour and try and keep some light side points for the players to use. Some of this sounds complex, but in reality it works really fluidly at the table. Rules are kept pretty abstract for the most part in order to keep the system relatively simple so they don't get in the way. The dice results surprisingly, even for ardent role-players who don't always go with dice rolling, drive the flow of the game in a greater way than I've experienced in other systems. The dice allow the GM to say yes to even the most ridiculous requests of the players, if they really want to try it. You really want to try running and slipping under that rapidly closing blast door in the rain while being shot at? Well that will be a difficult athletics skill roll and I'll add 2 setback dice to the roll and spend a dark side point to add the nasty red challenge die to the pool (the only die with the dreaded despair result.) Are you sure you wish to try? And let the dice be the judge. The flavour of the game through the text is excellent, it really grabs you as a Star Wars game, not as a generic game with an interesting system. The rules really emphasize the narrative nature of the game and the fact that the players are joining the GM in making the world work, not just sitting through the GM's prepared adventure. If you have any interest in playing in the Star Wars universe this is definitely the game for you, and I say that as a huge fan of the original West End Games D6 game. This is some of the most fun role-playing I've had since I can remember. Highly, highly recommended. Oh, and don't try and convert, use the special dice, you'll get so much more out of it if you do.